As Jeremy Vine, in the foreword to a new book about journalism titled Face the Future, describes returning to the Coventry Evening Telegraph to find the editorial staff cut from 85 to less than 20, ‘facing the future’ feels more like ‘facing the music’. I think we all felt sad, standing across the road in the chill wind and looking at the bedraggled giant we had abandoned two decades before. But a sense of the inevitable takes the edge off any sadness: it had to happen, didn’t it? Yes, it did. Journalism is shifting inevitably away from the printed word toward the digital future, and regional newspapers were always unlikely to be ahead of the game. But despite the nostalgic, forlorn reflections of the opening few paragraphs, the editors of Face the Future: Tools for the modern age have assembled a collection of essays that look unequivocally forward. From one BBC veteran to another, Peter Barron sets a different tone in an early chapter, titled “Staring into the crystal ball, and seeing a bright future for journalism”. Barron, who nailed his colours to the new media mast when he left the BBC for Google in 2008, doesn’t see anything very new about the disruption caused by digital media. In this chapter I will argue that, rather than seeing the looming extinction of journalism, we are seeing its reinvention. It will no doubt be a painful reinvention, but you need only look back to the advent of radio, television and cable news to see that disruption caused by technological innovation is nothing new. So, what might this future for journalism look like? Twitter, hyperlocal, SEO, coding, crowdsourcing, WikiLeaks, real-time data, personal branding, all terms that many industry folk are well accustomed to but all ideas and technologies still in their comparative infancy. They form the focus of some of the chapters in the book, which features contributions from the likes of Paul Bradshaw, Alan Rusbridger, Malcolm Coles, Oliver Snoddy, Josh Halliday, and former Journalism.co.uk senior reporter Judith Townend. Along with our former editor Laura Oliver, Townend will be appearing alongside Raymond Snoddy and Kevin Marsh on a panel at the Frontline Club tonight to launch the book, which was edited by Coventry University senior lecturer in broadcasting John Mair and University of Lincoln journalism professor Richard Lance Keeble. Mair and Keeble collaborated on another book of essays last year, Afghanistan, War and the Media: Deadlines and Frontlines. See extracts from the book on Journalism.co.uk at this link. Face the Future: Tools for the modern age is available now priced £17.95. ISBN: 978-1-84549-483-4. This entry was posted in Events, Journalism, Online Journalism and tagged Coventry University, face the future, Frontline Club, Jeremy Vine, John Mair, Peter Barron, Richard Lance Keeble on April 5, 2011 by Joel Gunter. Coventry University and the BBC College of Journalism have teamed up to run today’s Face the Future event – 11 quickfire sessions on the challenges facing journalists working in digital, starting from 1:30pm. The event will be available via video catch up on the BBC College of Journalism site and is being liveblogged on the CUtoday blog. To follow the conversation around the event use the hashtag #facethefuture. Speakers include Jeff Jarvis via Skype, visiting professor at City University London Paul Bradshaw, TheBusinessDesk.com’s Marc Reeves and Sky News’ Julian Marsh. A full programme is available at this link. This entry was posted in Events and tagged BBC College of Journalism, Coventry University, Events on November 24, 2010 by Laura Oliver. I knew that Kirst Wark hadn’t lost it when I saw her doorstepping Nick Clegg all the way up the aisle of Sheffield Town Hall on Election night 2010. He was not best pleased. 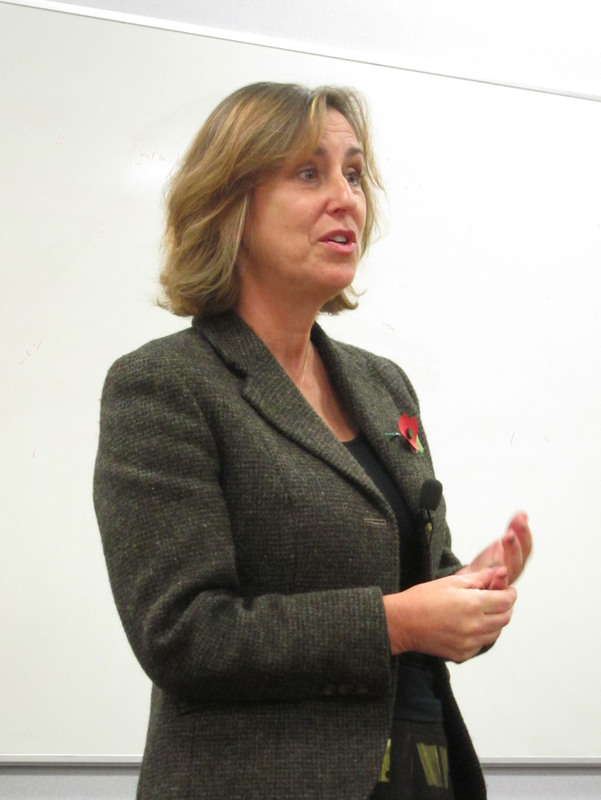 It was then that I decided to try and get her to speak at Coventry Conversations, and last wednesday she did, delivering a masterclass for Coventry University’s journalism students. At that same Sheffield election count, Wark was about to do her first live stand-upper into the Dimbleby programme when two old ladies came by, “in a Moris Minor I think”. They told her that they’d not been able to vote, the queues at the polling station were too long and had shut before they could get in. A good yarn, especially as, in line with BBC post Hutton rules, it had two sources – both in the same car. Wark had to make a judgment call based on that hinterland of life in front of and behind the camera. She decided to broadcast thirty seconds later. She was right. She broke the story and it ran for hours overnight and for days afterwards. You cannot teach that nous. Wark has now been in front of camera for nigh on three decades. She was a producer and director for BBC Scotland when the series producer suggested she take a try the other side of the lens on a political programme. She has never looked back. Today she commands the studio of Newsnight’s Review Show. Wark left her Coventry town and gown audience in no doubt about the secret of good TV journalism – good research and hard work. Each interview is meticulously researched and brainstormed with her producers. “When you’ve done your homework, only then can you throw it away and respond using what you already know,” she said. Wark was her own fiercest critic when it came to the interviews that had failed. When asked if she thought her style in the Alex Salmond interview in 2007, which was criticised for being rude and dismissive, was justified, Wark responded frankly: “It was overly aggressive and I later apologised”, she said. She told the audience that her favourite interviews were with Margaret Thatcher and Libertine Pete Doherty. Her least favourite was with disgraced Tory peer Lord Jeffrey Archer – “he was condescending”. Wark stopped in Coventry on her way from her home in Scotland to London to present Newsnight the next evening. Her day would start early, she explained, with phone calls to the editor of the night at 9am and continue right through to transmission at 10.30pm. Newsnight satisfied her ‘nosiness’ but also meant she had to be constantly abreast of the world through reading, reading and more reading, she said. She is buoyant about the state of journalism today. She believes no matter who the reporter or what the content, “as long as the journalism is rigorous and investigative it’s valid”. She added that if it helps to introduce a different demographic of viewer to news and current affairs, then programmes such as Sky’s Ross Kemp in Afghanistan have just as much place in the sphere as Newsnight. So what’s next for Kirsty Wark? With a book and a documentary in the pipeline, as well as Newsnight and the successful Glasgow-based Review Show, ratings are as strong as ever and it appears that she will be a fixture on our screens for some time. John Mair is a senior lecturer in broadcasting at Coventry University. He founded and runs the twice weekly Coventry Conversations. This entry was posted in Events, Training and tagged BBC, coventry conversations, Coventry University, kirst wark, Newsnight on November 1, 2010 by John Mair. 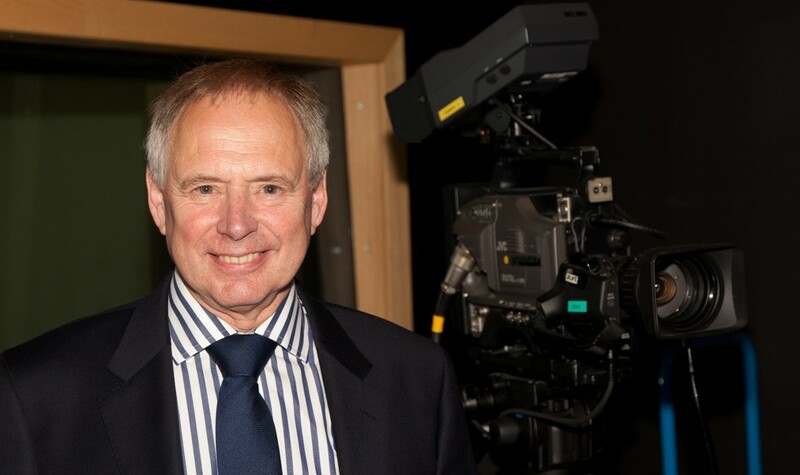 Nick Owen has been a fixture on Midlands TV screens for 32 years now. Today, he is the main presenter on the BBC’s Midlands Today and has been for 13 years. Before that there was Central News, the ITV World Cup in 1990, Good morning with Anne and Nick on the BBC until 1996 and, most famously, the time that he, Anne Diamond and Roland Rat saved TV-am (or TV-mayhem! as it had became known) in 1983. Owen, who had taken time off from the BBC Mailbox newsroom to come to Coventry, revealed that he still got excited about appearing live on screen. The nadir of his TV career was when an IRA bomb went off at the Tory Conference in October 1984, John Stapleton, then a TV-am reporter, had left Brighton so TV-am were exposed: “We were left with one man in a remote studio and me in London with another man for two hours.” Despite the bad days, he is proud to have been a part of the saving of TV-am, he said. On TV-am Owen was bit of a boy next door type, but in TV he is a true broadcast veteran. Should he be the old man next door perhaps? 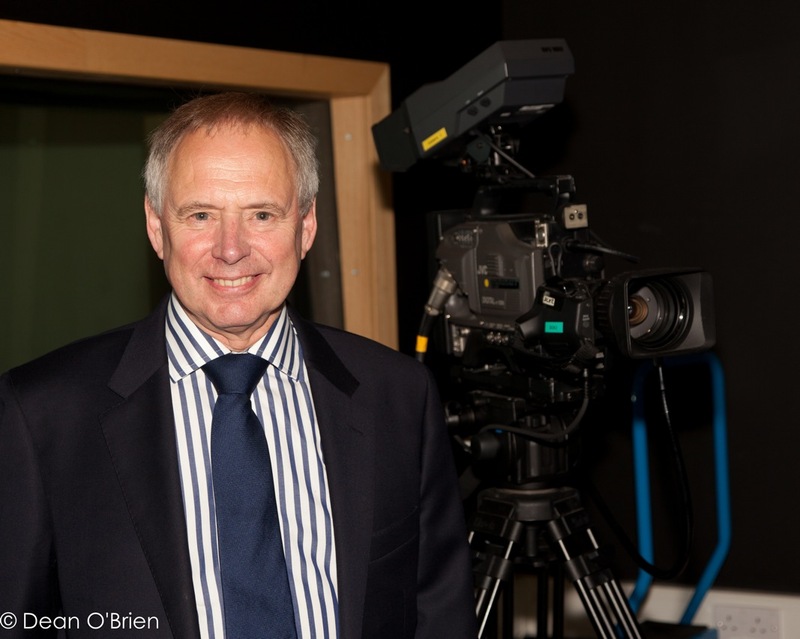 This entry was posted in Broadcasting, Training and tagged coventry conversations, Coventry University, nick owen, tv-am on October 11, 2010 by John Mair. Jon Snow has presented Channel 4 News for 21 years.He has worked in television news for more than three decades, always at ITN, but he is also the Visiting Professor of Broadcast Journalism at Coventry University. What he does not know about making TV news and Current Affairs probably is not worth knowing and late last week, Snow passed on the wisdom of his years to young wannabe hacks at Coventry University. 1. Stay sober: a lesson he learned in his early days at ITN then awash, in his view, with alcohol. The truth is you had to be pissed to get on in television. People drank vast quantities whilst they were working. We had a bar inside the studios and people would put out the lunchtime news and go and have a few pints and then go back to work completely squiffy. I went across the road to the wine bar, sat down with them and after about an hour, realising I still had to do a piece for News at 10, there were six empty wine bottles on the table and only three of us, so I realised I must have drunk at least one-and-a-half of them. I was now squiffy in any case. After a time I wanted to go to loo, so I went downstairs to the gents and I was unsteady on my feet and lurched into the cistern. It detached itself from the wall and crashed into the throne and then exploded in an eruption of water cascading everywhere. I made a very fast retreat, shut the door, saw the water pouring out underneath. I saw these two guys sitting there and thought ‘they’re going to drown’ and I said ‘chaps, got to get back and get my piece on for news at 10’. I sat there watching out of the window thinking this was the end of my career. It wasn’t. Snow has not really drunk on the job since. 2. Keep it simple: Jon explained how he had appreciated reporting from Haiti after the earthquake had struck in January, because it went back to his roots – finding stories and telling them, simply, to viewers using all original footage and through this simplicity touching the hearts of millions. He pointed to the fact that £100 million was given by the British public to Haiti Relief partly as a result of the messages from broadcasters. Snow is planning to return soon to Haiti to follow up on the stories. 3. Expect the unexpected: Tuesday 11 May was a moment of “complete magic” for Snow, as Channel 4 News went live outside Downing Street to broadcast the resignation of Gordon Brown. At 18 minutes past seven the car comes out and we have no idea where things are going. Normally the great thing about anchoring any programme is that you’ve got this thing [an earpiece], the lifeline, the umbilical chord to the producer, and they’re saying, ‘Jon he’s going to the Palace’. But they didn’t – I was hearing nothing but silence. I suddenly realised I was on a one-to-one adventure with the viewer. The viewer and I were equally ignorant about what was going to go on; it was a sublime moment of total equality when we were both peering at this helicopter image and the car was turning right and turning left. 5. Keep your cool, but lose it if you must: Snow was very sympathetic to Sky News Political editor Adam Boulton about his outburst on air to Alastair Campbell on 10 May. It’s no good asking, ‘should anybody have lost anything?’ He lost it, so what? Good God, the world would be duller place if people didn’t lose it (…) what’s misconduct? If he’s guilty of it I’ll have to go to the hang man’s noose. Snow said he saw Boulton’s outburst as a possible result of pressures building up on Boulton and Sky News to move along the road to a more Fox News’ style approach. This entry was posted in Events and tagged Channel 4 News, coventry conversations, Coventry University, Jon Snow on June 2, 2010 by John Mair. Could peace journalism offer a future for news media? “Peace journalism is solution-orientated. It gives a voice to the voiceless. It’s attempting to humanise the enemy and exposing lies on all sides, highlighting peace initiatives and focusing on the invisible effects of violence, such as psychological trauma,” he said. Keeble attacked the traditional media, for acting as propaganda for war, rather than a resolution promoter, but stressed the importance of alternative media in promoting peace journalism. This entry was posted in Events, Journalism and tagged coventry conversations, Coventry University, Events, Peace Journalism, richard keeble on April 30, 2010 by Teo Beleaga. From the frontline: how ‘true’ is the media’s picture of Afghanistan? Journalists gathered to discuss the British media’s coverage of the war in Afghanistan at last week’s video conference at Coventry University. The ‘Afghanistan – are we embedding the truth?’ event, chaired by the editor of the BBC College of Journalism, Kevin Marsh, brought journalists such as Vaughan Smith and Stuart Ramsay together with academics Richard Keeble and Tim Luckhurst, and the Ministry of Defence’s head of Operational Communication, Brigadier Mark van der Lande. Vaughan Smith offered what was perhaps the most troubling thought: “Sports journalist knows more about sports than war correspondents know about war, and that is a cultural problem”. Vaughan, a news pioneer and independent video journalist who has in the past managed to disguise and bluff his way into an active duty unit to shoot uncontrolled footage of the Gulf war, also held up two photographs as part of his speech; one of Hiroshima’s mushroom cloud, and another of an injured civilian in Nagasaki. He used these photographs as evidence to explain that you never see enough of the second type, showing the injured and other devastating side effects. Instead, the audience is shown ‘Bang Bang’ images; “a fundamental problem,” he said. “However, it is a problem that paradoxically, with advances in technology and globalisation, we can do a lot more. Yet, we are reporting less than we used to,” he said. Brigadier Mark van der Lande argued that they don’t instantly show casualty because they have a duty to inform next of kin first. “We are not hiding things for the cost of war; we are looking out for individuals,” he said. It is difficult for the MoD, he said, because the ‘Bang Bang’ is what the audience and the media in general is interested in. Most of the time the more important things that the military look into aren’t released simply because “it is of less interest to the media and the audience,” he argued. The media do, to a certain extent, manufacture stories, agreed Tim Luckhurst, a Professor of Journalism at the University of Kent, but it is not because of dishonesty, it’s because “we simply cannot stay away from the impact kinetic stories get; embedded journalism serves the needs of the state. Robert Williams is a student at Coventry University. Read more here, over at Daniel Bennett’s blog, including detail of the video contribution from Channel 4 News’ Alex Thomson. This entry was posted in Events, Press freedom and ethics and tagged Afghanistan, Coventry University, Embedded journalism, Jonathan Marcus, Mark van der Lande, Tim Luckhurst, vaughan smith on March 23, 2010 by Robert Williams. Channel 4 News correspondent Alex Thomson was embedded with the Coldstream guards in Afghanistan, while they came under heavy fire from insurgents. [The film] reveals the state of relations between the Brits and the rather hapless Afghan army – who spend much of their time shooting in the wrong direction – or arresting, then releasing a local man who may, or may not have done anything wrong. Suddenly the troops come under heavy fire as the insurgents start shooting straight at them. Our team are pinned down with the soldiers as bullets fly overhead – even into one soldier’s head, whose helmet luckily saves him. Not much ground is won at the end of it all – but it’s a remarkable watch. (Not live) RMP shot in helmet wakes up realising he has woken up . Alive. A shd let hm keep smashed up helmet. He’s back on roof sentry. Thomson is due to participate in this week’s video conference in Coventry: Afghanistan – are we embedding the truth? The event is due to be livestreamed on this site and the BBC College of Journalism. The Twitter tag will be #afghancov. This entry was posted in Broadcasting, Editors' pick and tagged Afghanistan, alex thomson, BBC College of Journalism, Coventry University, military, War/Conflict on March 16, 2010 by Judith Townend.